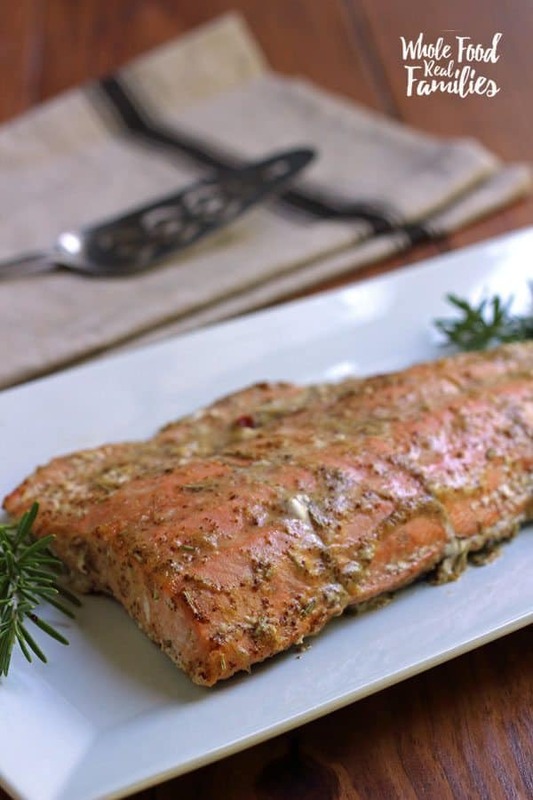 Honey Mustard Salmon with Rosemary is the perfect combination of zippy mustard and sweet honey. It is also the perfect combination of elegant dinner and weeknight quick cooking! 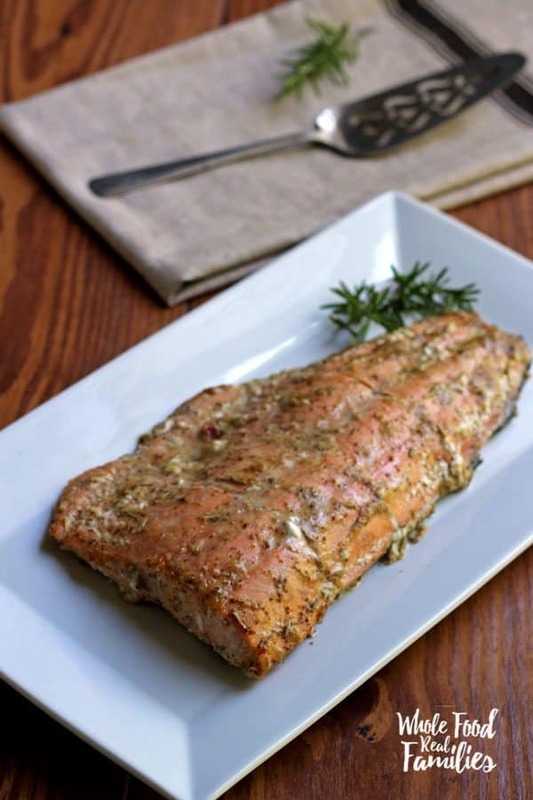 A roasted salmon filet is one of those meals that we eat again and again. First because it is healthy. Salmon is full of healthy fats that your body needs. Secondly because it is ridiculously easy to prep and get in the oven and it cooks in about 20 minutes. While everyone in my house has an opinion about what they prefer to be eating, Honey Mustard Salmon with Rosemary is always a hit. Word to the wise when cooking a whole salmon side – or really any fish. Line your sheet pan with aluminum foil! As delicious as salmon is, the oils from the fish can be hard to get off your pan. And just a little residual oil will make your next batch of cookies taste pretty interesting. Expecting a coup at dinner, I was pleasantly surprised when my husband and all 3 of my kids said, “Hey mom! This is really good!” That is a win at my house, because our 3 kids never agree on anything at the table, even if they all eat it. One of the side effects of teaching them to be detailed taste testers to meet my recipe testing needs. 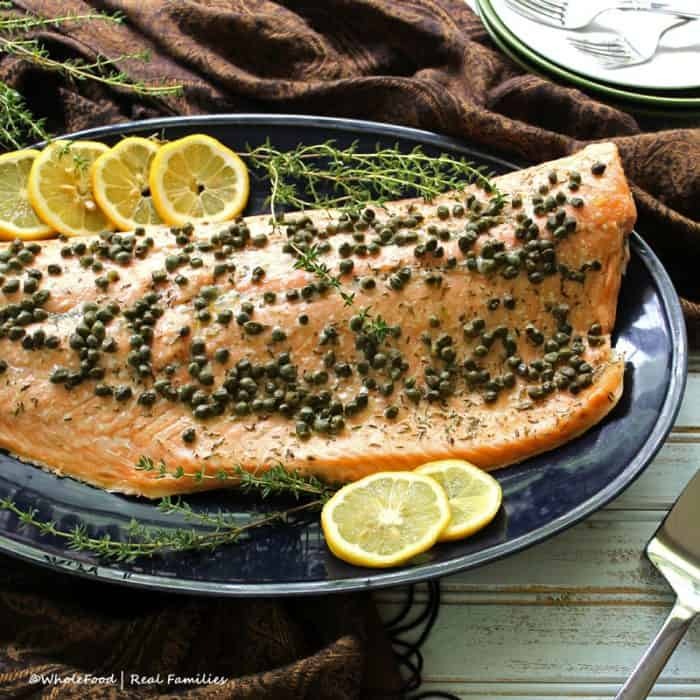 Want to try the Roasted Salmon with Capers too? You should! 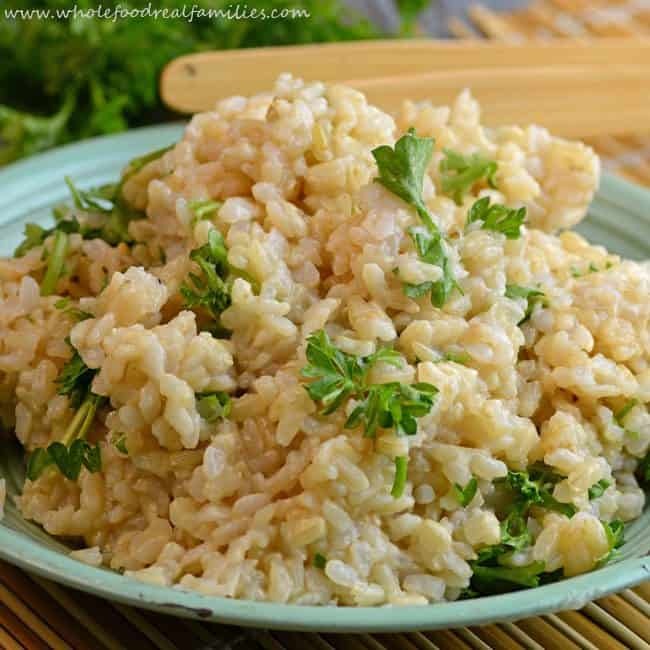 Try serving it with this Herbed Brown Rice. This is one of our favorite side dishes and is easy to make extra to use more than one time in a week. Cynthia Rusincovitch is an avid whole food advocate and the recipe developer and photographer behind Whole Food | Real Families. Cynthia spent 15 years as a marketing executive in Atlanta before moving to Savannah, Georgia. She is married to an aerospace engineer who likes to man the grill and has 3 children, a teenager and two toddlers. You can find her on Facebook, Instagram, Pinterest, or Twitter. Want to receive more of her recipes to your email? Sign up to the Whole Food | Real Families newsletter here. It will come to your inbox every Saturday just in time for your morning coffee! 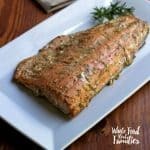 Honey Mustard Salmon with Rosemary is the perfect combination of zippy mustard and sweet honey. It is also the perfect elegant dinner too! In a small bowl, whisk mustard, honey, salt, olive oil, and rosemary until smooth. Brush it liberally on top of the salmon filet. Cover loosely with foil.